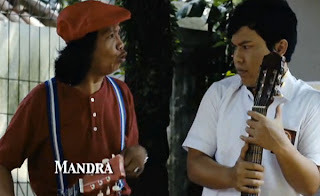 "Guardian: Baik-Baik Sayang" is one of the opening film in 2011, played in full by the band Guardians with all personnel. On the whole idea of this movie tells the story of life's journey from the band's own mayor, played by Apoy, Faank, Tom and Ovie. Where four young men are children boarding La Tansa who have similar interests and talents in music, so that eventually the four of them decided to make a band called Wali Band. Despite their boarding school life is fairly tight in terms of regulation and discipline, including an obligation to speak English or Arabic in his own day. But remember this is a modern and high quality boarding, the boarding schools themselves are very supportive of each activity that will support the ability of their students, including musical events that are very enthused by Apoy et al. Preaching activity can be done in various ways. Is Westi (Intan Nuraini) involved the story of romance with one of the Guardians of personnel, namely Faank. But their love story did not run smoothly, which Faank life as a musician is not approved by parents Westi, even more so when they both had an accident resulting in paralysis Westi. This love is not condoned by the family environment Westi. As if the trials were endlessly plagued this love story, come two beautiful students named Aziz (Arumi Bachsin) and Nurul (Sulis) begins a tenuous sense of love Faank. Likewise, the Westi who is rumored to be immediately paired with a rich kid named Bagas (Dennis Adhiswara). Hearing the news that an arranged marriage, Tom as a friend Faank also try to match it with one of his friends had for her sadness Santri not protracted. While on the other hand was secretly Apoy also quietly put hearts on Aziz and Azizah feel jealous of the closeness and Faank. This is put to good use by one of their friend, Hamza who had been jealous of their friendship and sense of always trying to find a way to dissolve it. Hamza tried to pit the two friends, but luckily one of the youngest mayor of personnel, namely Ovie always managed to fail those bad intentions. All stories of this life's journey would neatly summarized in the Guardian: "Baik-Baik Sayang".